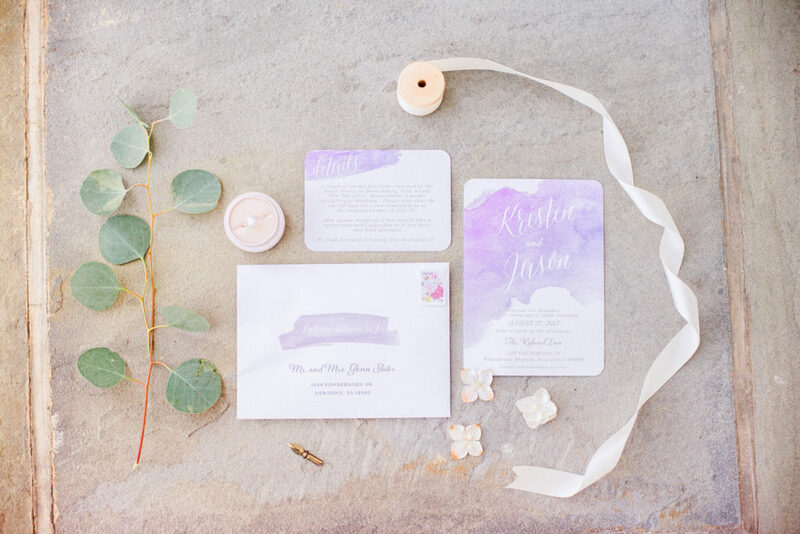 Purple is such an underrated color when it comes to weddings, but today’s feature brought to us by Delaney Dobson Photography proves that lilac can be just as beautiful as blush. 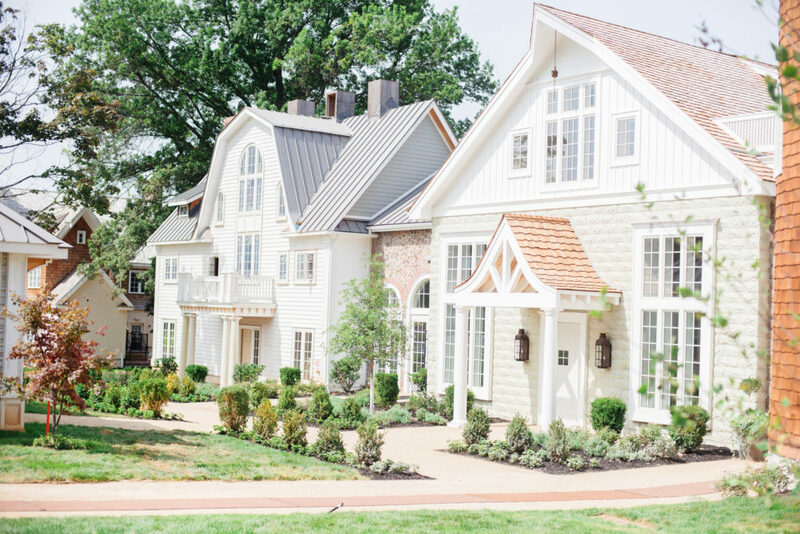 Not to mention, it’s filled to the brim with the prettiest details that will make you feel as if you’re in an enchanted forest amongst the fairies. Case in point? 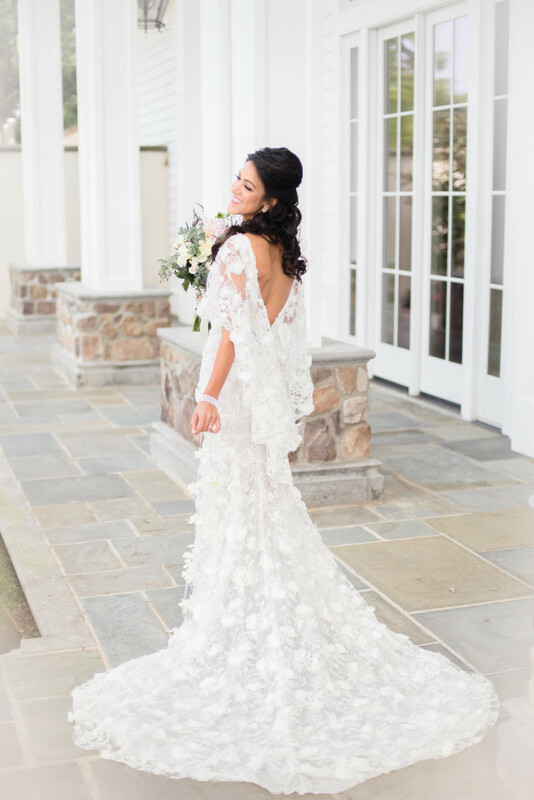 The bride’s Marchesa wedding gown embellished with 3D floral appliqués, moss detailing, and the most lush and whimsy flowers we ever laid eyes on. 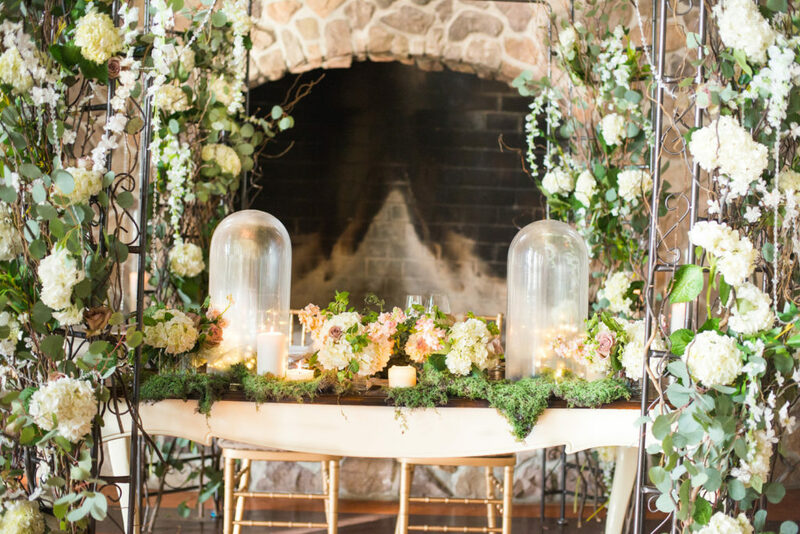 Add in personalized decor and centerpieces with suspended orbs, accompanied by globes with fairy lights and you have yourself one magical soiree. 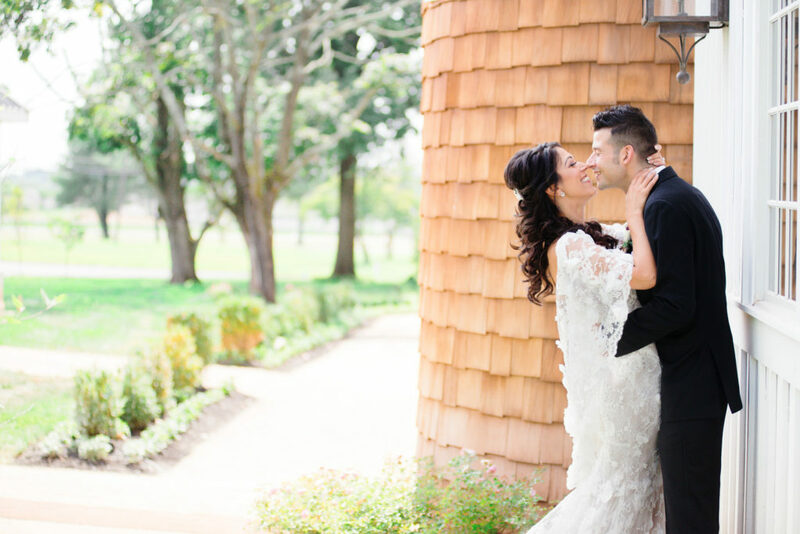 Kristen is the ultimate fairy bride and you just have to see for yourself below! 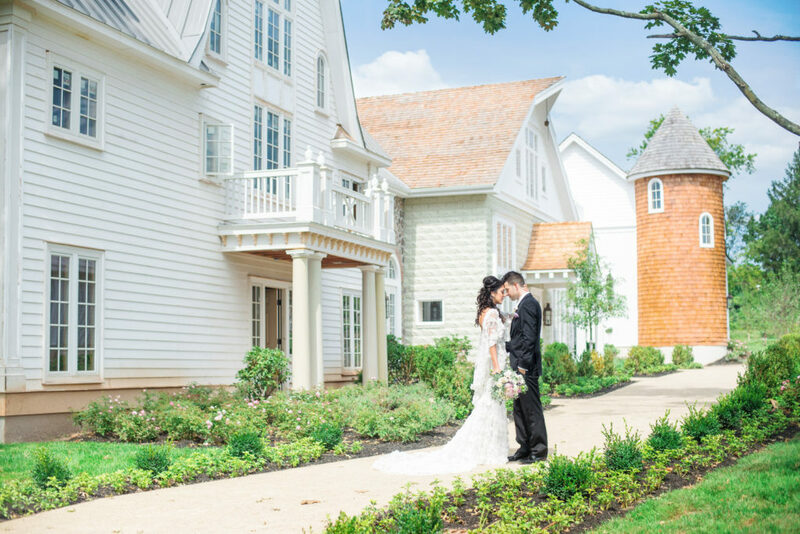 From Delaney Dobson Photography…Kristen knew that she wanted a fairy-like wedding and so the team of vendors set out to design a whimsical day for the magical couple. 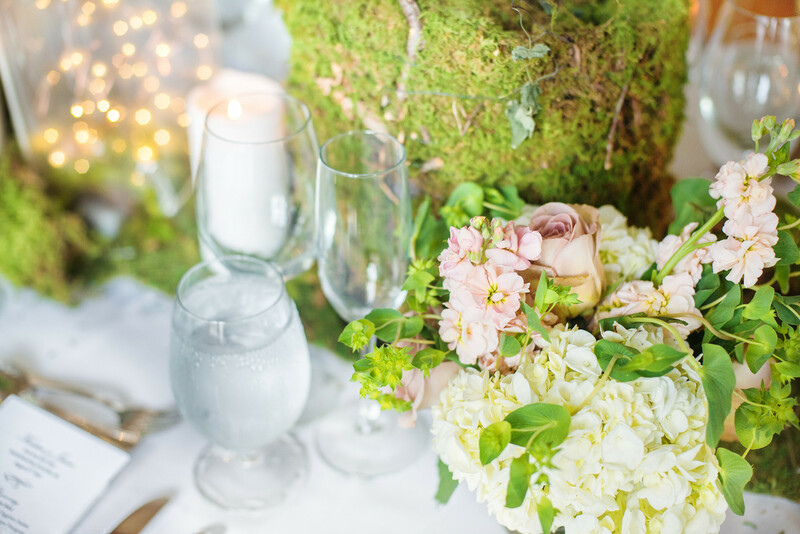 The dreamy color trio of purple, blush and white had the guests in awe as they walked through a beautiful room filled with greens, moss, tiny fairy lights, and stunning table decor. 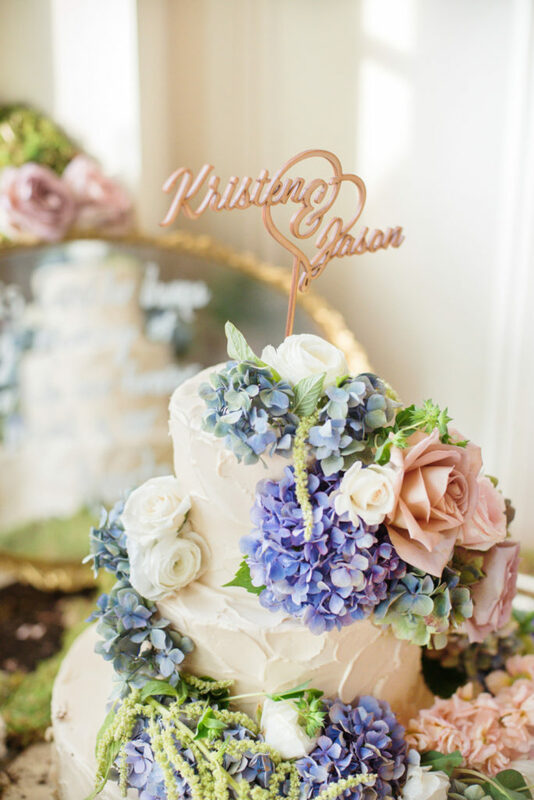 The decadent cake was adorned with the same soft tone flowers that could be found throughout the room and Flower girls carried fairy wands rather than bouquets. In place of a veil, Kristen wore a one of a kind flower vine that hung from her wrist and her stunning Marchesa gown truly made her look like an enchanted fairy. 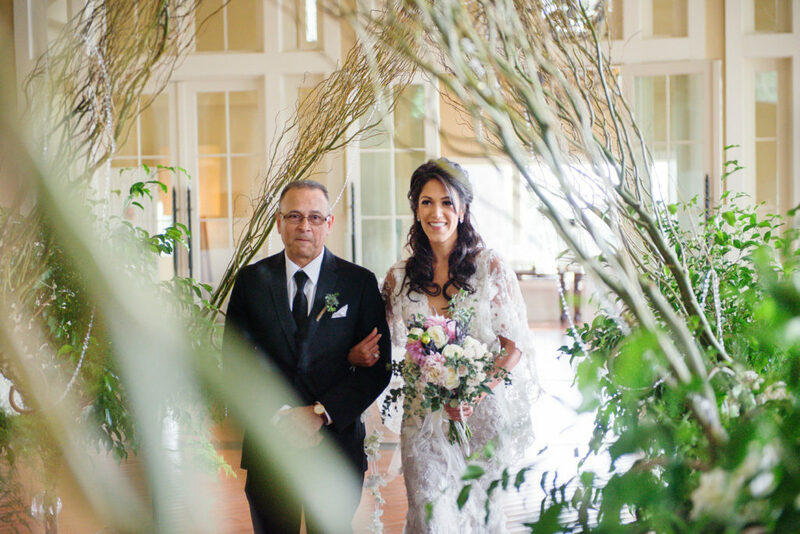 Kristen was escorted down the “woodland” aisle by her father where she exchanged vows with her soon-to-be husband, Jason. 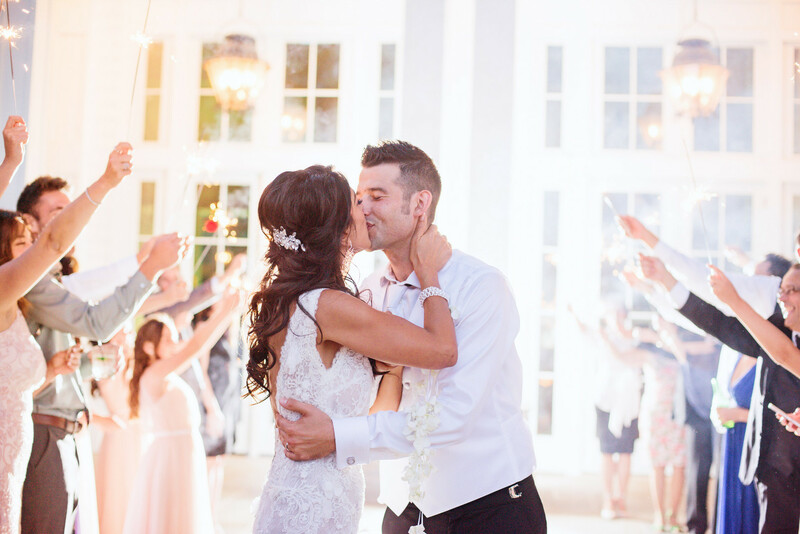 After a beautiful ceremony and a rowdy reception, the couple ran through a crowd of sparklers, marking the end to a beautiful and magical day. I am a huge admirer of Fairies, flowers and everything enchanted. I knew from the beginning I wanted to become the ultimate Fairy Bride. 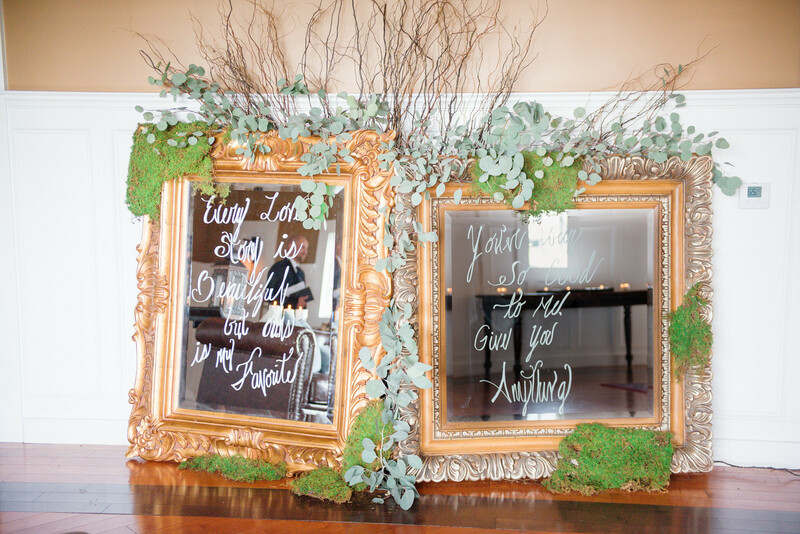 I wanted everyone to feel as if they were in an enchanted forest, surrounded by flowers, crystals, moss and LOVE ! 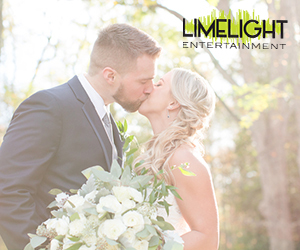 We also wanted an intimate setting for such a special occasion and so we only invited family and close friends. I envisioned walking through an Enchanted Forest towards my husband. 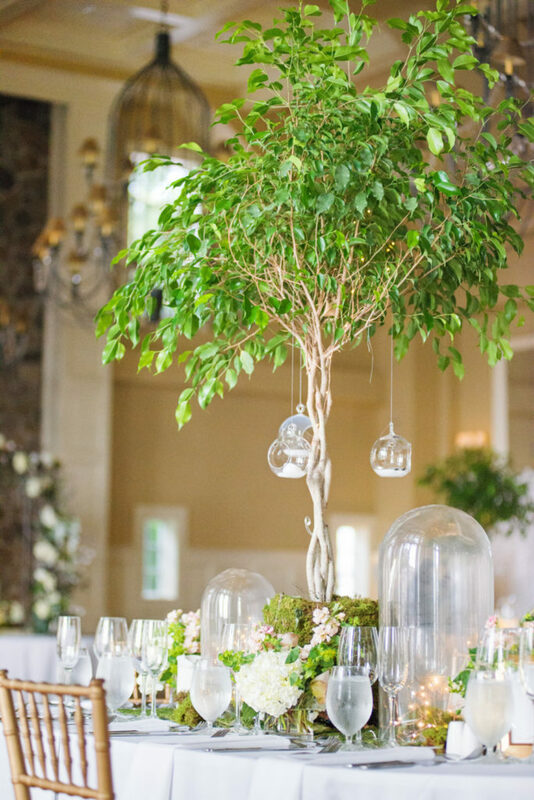 There were tree branches, adorned with glass balls, placed on both sides of the isle to give such an effect. 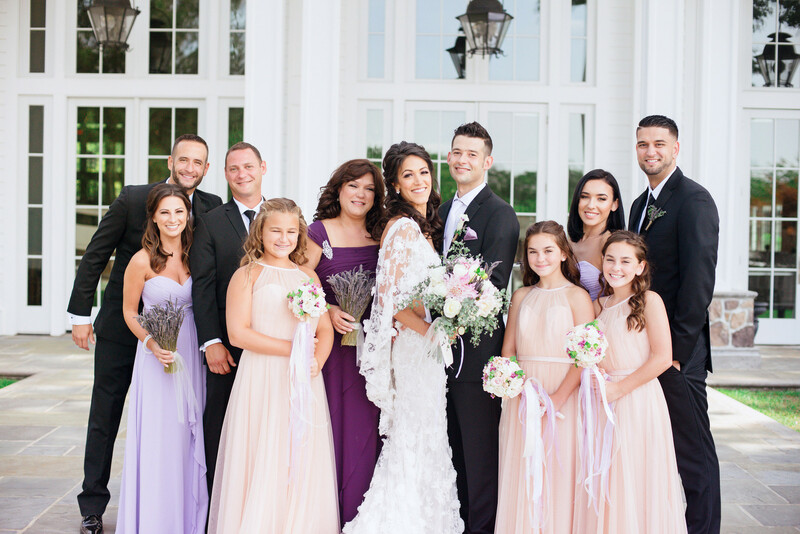 I wanted lots of greens as well as purple, blush and white colored flowers. My walk ended with us standing under a stunning flower arch. Later, that same flower arch was placed over our sweetheart table. To add that “enchanted” touch, crystals were also used. 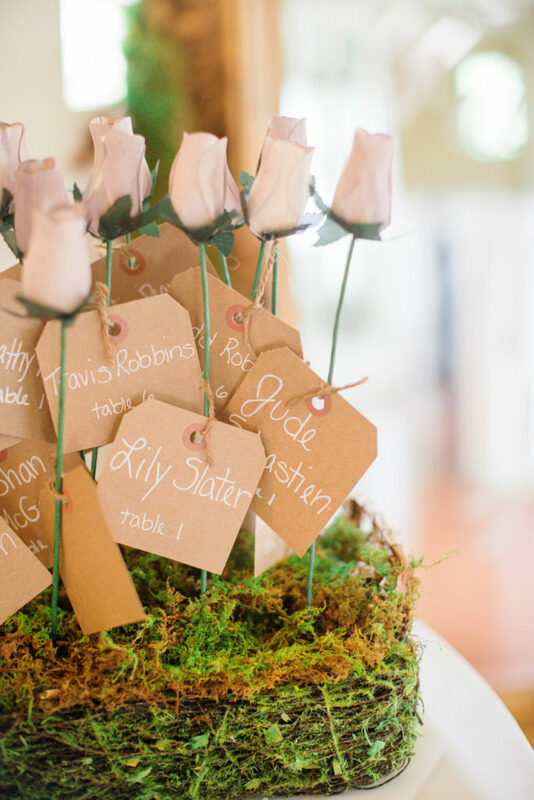 Each reception table had a ficah tree placed in the middle with hanging crystal balls, along with lots of moss, flowers and fairy lights ! My wedding designer was fabulous and really brought my vision to life. Flowers were a crucial element!! When you think of Fairies, you think flowers. 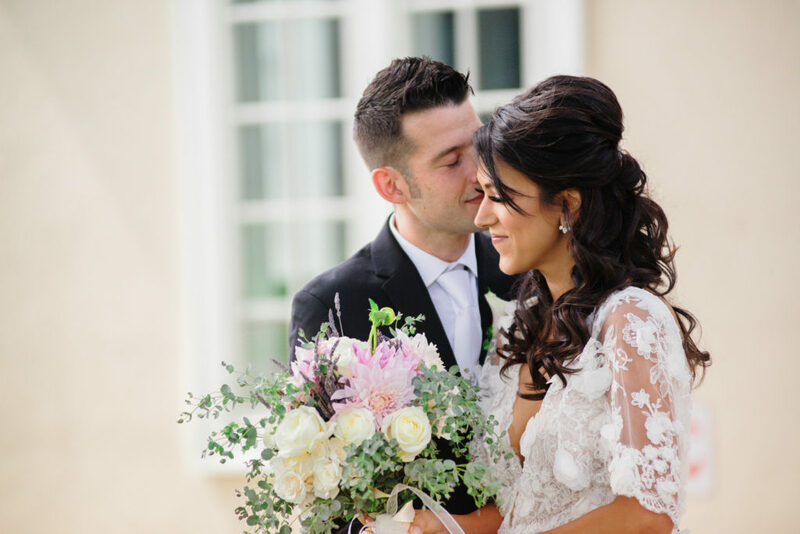 My bouquet consisted of white cloud garden roses, dahlias, white majolica spray roses, dried lavender and gunni eucalyptus. I wanted real forest elements as well as elegant, feminine flowers. 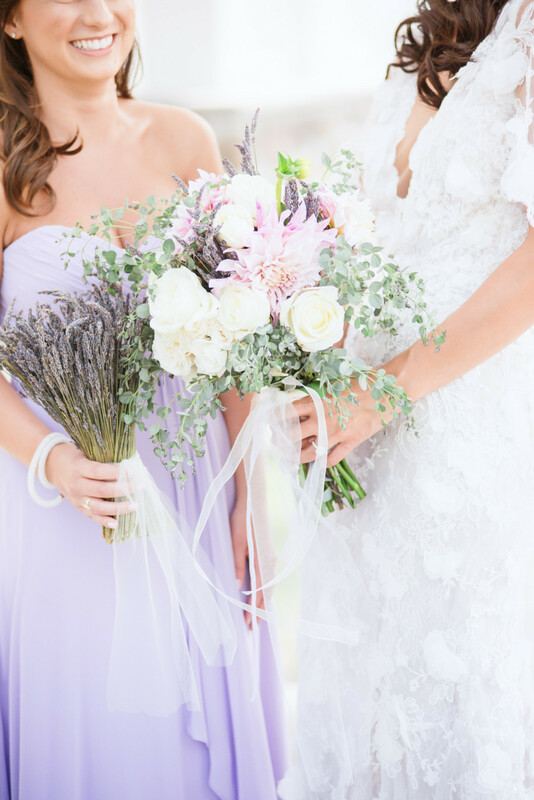 The bouquets for my bridesmaids were dried lavender. I wanted simple. My junior bridesmaids did not have a bouquet. They had fairy wands! Last and certainly not least, I had a custom flower train made for myself. Attached to a pearl bracelet, I had white hand sewn orchids hanging from my wrist. 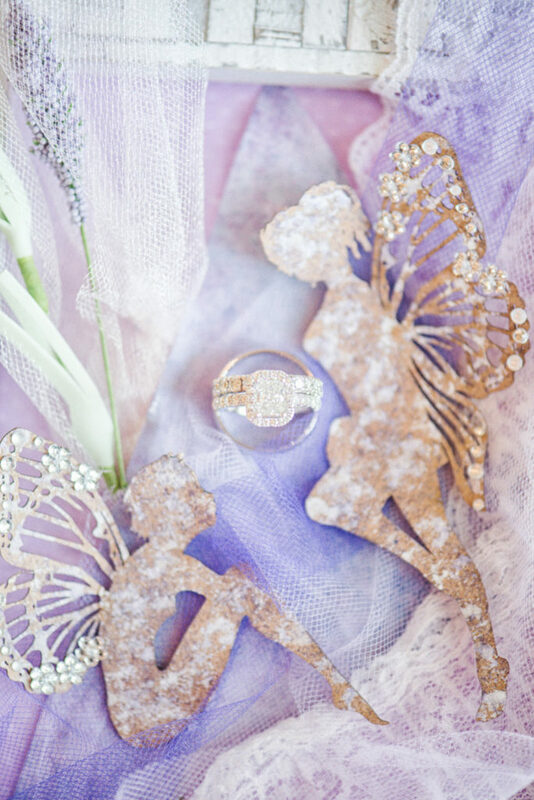 A truly delicate touch for a fairy bride. I did not want a cliche, ordinary bridal gown. I stumbled upon this gown by surprise. It was the second gown I tried on and I knew I had to look NO further. It was Marchesa and embodied everything I was looking for. It had a plunging neckline, an elegant low back and a beautiful train. It was sleeveless with beautiful textural bead work, crystals and 3D flower appliqués. Most unique of all, my gown came with a cape adorned with more flower appliques on top of lace. It was truly one of a mind. I only removed the cape for the reception! The dress was so stunning I did not want a veil covering it. I also chose to stick with minimal jewelry – Swarovski earring jackets. My husband wanted to look polished, classic and handsome, which is easy for him! Vera Wang embodies such a look. He chose a standard slim cut black tux with a white shirt and vest. 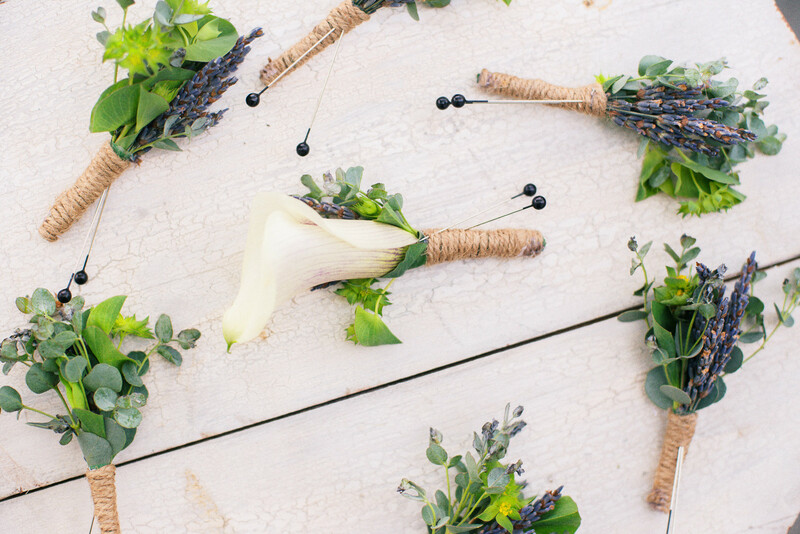 We made sure to pair him with a Lavender handkerchief to match the Enchanted Forest theme. His cuff links were a gift given to him by me and they contained the words of our first song “So Good To Me” by Chris Malinchak. 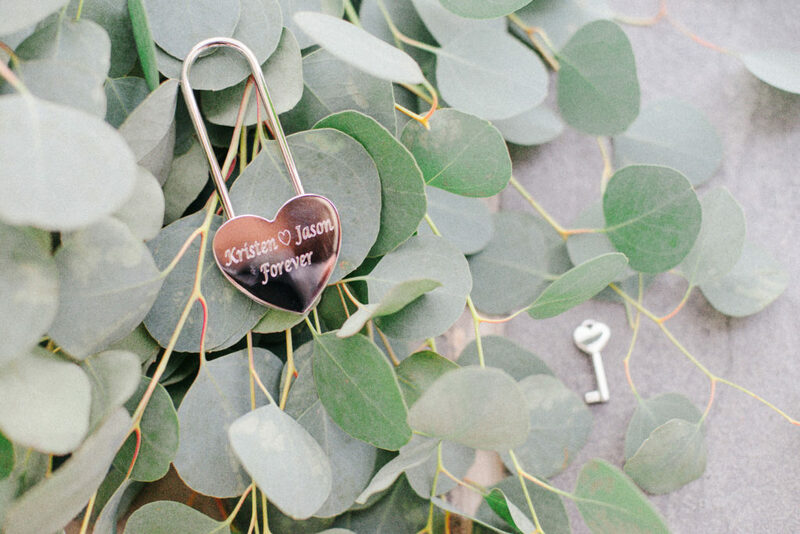 Almost every detail of our wedding was personalized. We first greeted our guests with a delicious housemade Lavender lemonade to instantly welcome them to the Enchanted Forest. We also LOVE to dance. On our invitations we asked every guest to contribute one song. We played those songs during our cocktail hour and reception. The entire playlist was hand selected by my husband and myself. I walked down the isle to “Fairytale” by Enya! Every song was carefully chosen. We also had a sparkler photo session outside. Fairies absolutely adore things that sparkle. It was quite dreamy with the sun setting and just perfect for our intimate wedding. 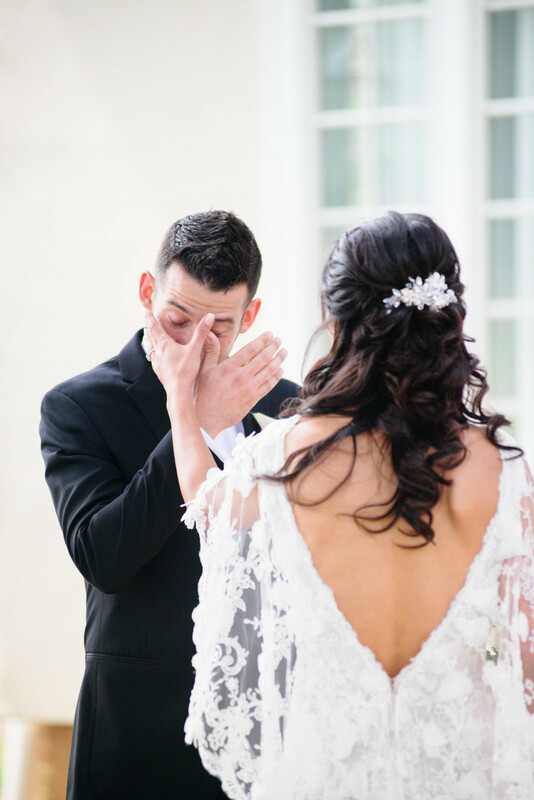 My absolute favorite moment was our first look. The weather was perfect. Our venue was stunning. It was a time where Jason and I were alone from everyone and everything and were really able to relish in the love we have for one another. I remember tapping his shoulder, smiling SO big, so excited for him to see me. He turned around and was shocked. I was SO proud to be standing there as his beautiful wife. He cried tears of happiness looking at me. 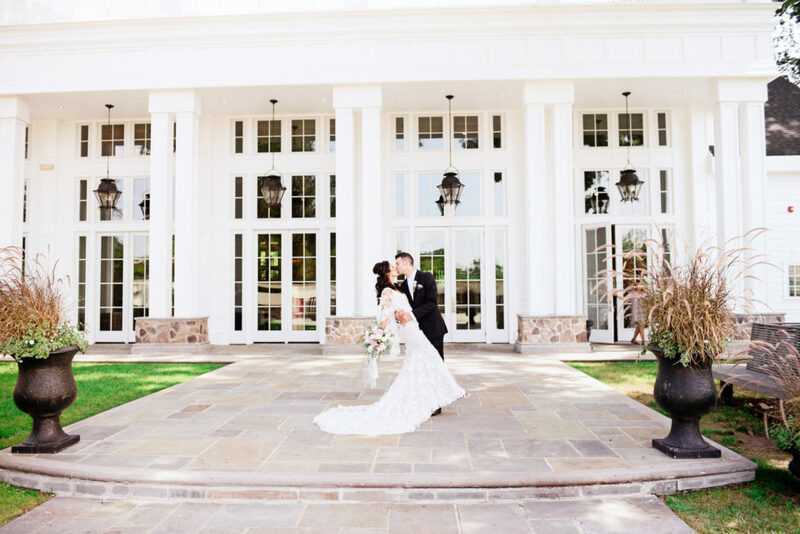 A moment of pure joy that was captured perfectly by our photographer. Adding to this, our first dance was not your typical slow dance. Jason and I fast danced to “So Good To Me” by Chris Malinchak. It is a dance song ! We chose it because we both knew we fell in love with each other the moment we heard that song together. Naturally, we had a dance party in our cars and listened to it in repeat.